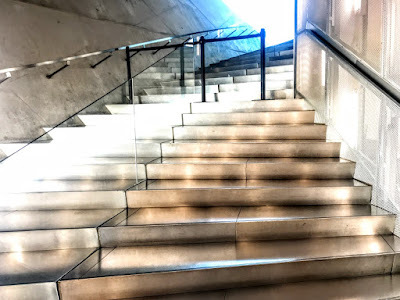 I had lunch one afternoon last week in the Casa da Música (the House of Music) in Porto. This spectacular, multifaceted building at the top of Avenida de Boavista is a masterpiece in modern architecture by the innovative Dutch architect Rem Koolhaas. 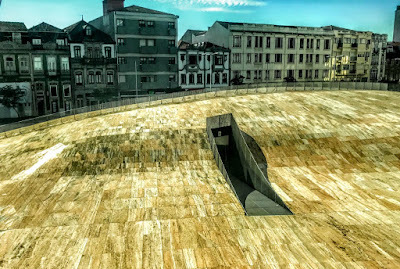 The Casa da Música was planned as part of Porto’s celebration as the European Capital of Culture in 2001. 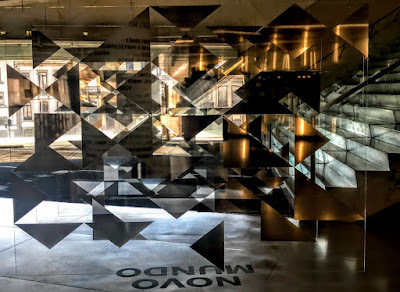 It was designed by the Dutch architect Rem Koolhaas, in association with the Porto Office of Metropolitan Architecture, the scene agency Ducks scéno, the acoustic designer Renz Van Luxemburg and AFA. The building engineers were AFA Arup Group (London) and Afassociados (Porto). 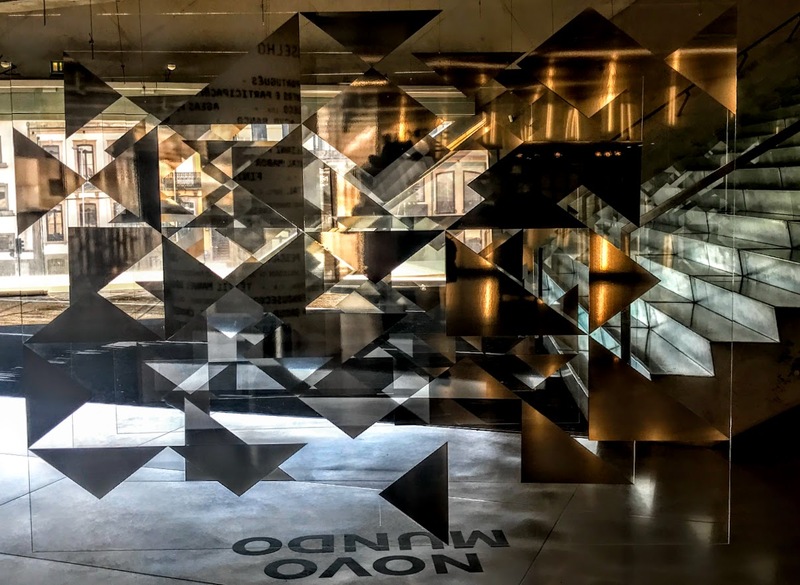 The interiors of the Casa da Música were designed by Inside Outside (Petra Blaisse). They include 13 large surfaces, ranging from 22 by 15 metres to 65 by 8 metres, with a gold leaf wood grain pattern in the large auditorium. Because of its unusual configuration, the building was a challenge to the engineers and builders. Building work took four years and the project ran over schedule, so that building was not completed until 2005 – four years after Porto had celebrated being the European Capital of Culture. The final cost was over €100 million. The Casa da Música finally opened on 14 April 2005, with performances by Clã and Lou Reed. 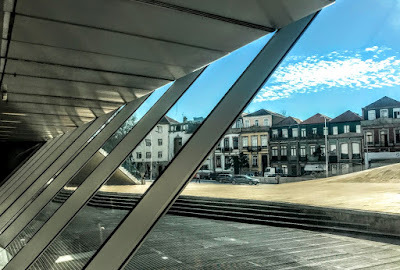 The official inauguration took place the next day in the presence of the Portuguese President, Prime Minister and other prominent public figures, with a concert by the Orquestra Nacional do Porto. Immediately, the Casa da Música became a city icon. With a 1,300-seat auditorium suffused with daylight, it is the only concert hall in the world with two walls made entirely of glass. The building stands on its own in a paved square, between two main traffic routes at the Boavista roundabout, where many of Porto’s roads and avenues converge. Nearby, the Praça Mouzinho de Albuquerque is a large green space with many trees and the monument to the Heroes of the Peninsular War who liberated Portugal from Napoleon’s occupying forces. This innovative building is composed of an asymmetrical polyhedron that extends over nine floors. The building is covered in plaques of white cement, cut by large undulated or plane glass windows. The principal entrance and its staircase face onto Avenida da Boavista. The building is surrounded by a yellow marble pavement with a hint of brown, giving interesting and added dimension and beauty to the building and the neighbourhood. There are two main auditoriums inside. But the Casa da Música is designed so that many other spaces can be adapted for concerts and other cultural activities, such as workshops, recitals and educational visits. At the heart of the building, the large 1,100 square metres rectangular auditorium, the Sala Suggia, is named as a tribute to the great Portuguese cellist Guilhermina de Medhin Suggia (1885-1950). This space includes a sloped arena with seating for 1,238 and flexibility to vary the space, as well as two balconies. The glazed windows give a visual connection to the public spaces outside. The spaces are decorated predominantly in gold and silver tones. The smaller auditorium on the fifth floor is a highly flexible space. This 320 square metre area can hold audiences of 300 seated and 600 standing, depending on the event, the location of the stage, and the size of equipment. Throughout the building, there are many other open spaces for artistic, cultural and musical events. The Cybermúsica Hall, a 156 square metres space on the fourth floor, is used for innovative educational projects. Its ceiling and walls lined with pyramidal volumes. The Renaissance Hall on the fifth floor is covered in decorative blue, green and white azulejos. There are also purple and orange halls on the fifth floor for children’s events. The VIP hall on the sixth floor is a multi-functional space for small groups. The walls and ceilings are covered in azulejo panels, replicas of many hand-painted tiles typical of churches, public buildings and museums across Portugal. The area on the seventh floor is divided into platforms that are raised to the top, in glass, transformed into a terrace, with views out to the sea. It is used for book launches, press conferences, public presentations and receptions. The roof-top restaurant and terrace is placed within two of the polyhedron’s vertices. Here an esplanade offers views across Boavista and the city of Porto. The restaurant has direct access to the main auditorium and is lit through an elaborate light that included hundreds of bottles of pommery champagne. In the original plan, the restaurant would seat 250 people, but this has been scaled back to 50. The building also has smaller halls of different sizes in the sub-basement used for training and group activities. 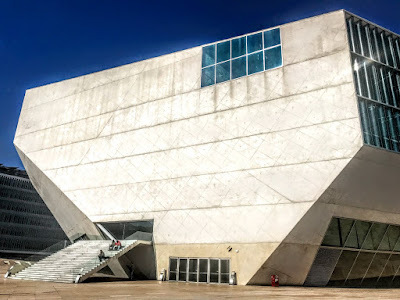 Today, the Casa da Música is home to the Fundação Casa da Música, and to three orchestras: Orquestra Nacional do Porto (Porto National Orchestra), Orquestra Barroca (Baroque Orchestra) and Remix Ensemble.